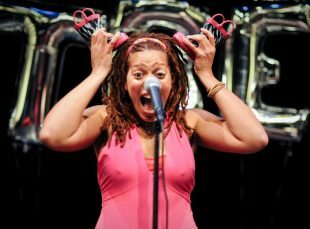 A six foot-tall, smiling face with the bright, soulful voice and pink boots on her ears? Meredith Wright AKA Sweetbeatz “charms the kids to their bones…” Her original tunes and enthusiastic jams celebrate the spirit and sassiness of kids in the city in one dazzling performance. The rhythm of our feet as we stroll down the street, the rumble-tumble grooves of the Laundromat, unique hairstyles that shake and swing, Meredith finds music in everything. An unforgettable playdate!